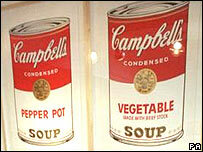 The Campbell's Condensed Soup tin, made famous by pop artist Andy Warhol, has been canned by new owner Premier Foods. The iconic cans will be rebranded as Batchelors Condensed Soup from March, as the limited licence Premier had for the brand name expires in mid 2008. But labels for the new style cans will carry the legend: "Formerly Campbell's. Same great taste." Under last year's £450m ($830m) deal Premier bought Campbell Soup Company in the UK and Ireland, but not the brand. Premier Foods, based in St Albans, Hertfordshire, will rename all 22 flavours as Batchelors - and recipes for the soups will remain the same. A further twist in the takeover deal also means that US-based Campbell Soup Company will still produce Campbell's Condensed Soup but cannot sell the product in the UK for another five years. Premier Foods also owns well-known kitchen staples Branston Pickle, Oxo, Homepride and Fray Bentos in the UK and Ireland.